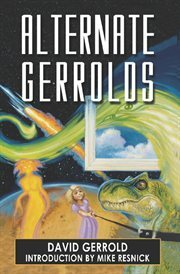 The item Alternate Gerrolds : an assortment of fictitious lives, (ebook) represents a specific, individual, material embodiment of a distinct intellectual or artistic creation found in Charlotte Mecklenburg Library. Stories by a Nebula Award winner! In "Franz Kafka, Superhero!" Kafka employs his unusual metamorphosis to fight evil throughout the world-and take on Sigmund Freud. Two characters who hope to better themselves experience "The Seminar from Hell"-while "The Firebringers" features Humphrey Bogart, Gregory Peck, Ronald Reagan, and Jimmy Stewart as soldiers charged with dropping the first atom bomb. A team of anthropologists struggles to understand the artifacts of a mysterious alien race in "Digging in Gehenna." With wit and imagination, the stories in this volume range from alternate-history adventures to meditations on exploration and the fight against evil-and represent a showcase for the amazing imagination of the Hugo and Nebula Award-winning author renowned for writing the Star Trek episode "The Trouble with Tribbles."